With all the attention to cupcakes of late, there is little on cupcake forensics. I will dissect a birthday cupcake for you. Sometimes, certain recipes, foods, or food combinations, for that matter, get in one’s mind and do not go away. On the very informative instructional site, A Feast for the Eyes, I recently had come across Debby’s recipe for Chocolate Bliss Cake. 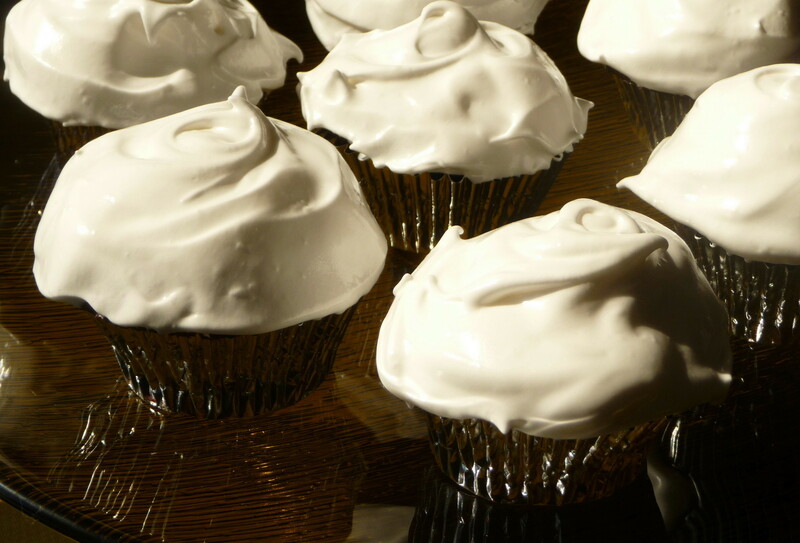 I really liked the idea of an easy five-minute version of the classic seven-minute meringue icing (thank you, King Arthur Flour, for this simpler version!). I thought it would go well with Debby’s moist chocolate cake – which included my favourite addition of coffee – and a chocolate buttercream filling. While I am a big fan of chocolate cake with the icing of the same flavour, the contrast of a light, marshmallowy meringue icing is a treat for both the senses of sight and taste. However, I also had been thinking about chocolate malt since I read Geni’s recipe for Chocolate Malt Cake on the engaging blog, Sweet and Crumby. Chocolate and malt – as in Whoppers, Maltesers (NB: this site prevents visitors under 12-year-old from exploring these chocolate-malt treats further…), chocolate malted milk balls, or a thick chocolate malted ice cream shake – are an irresistible combination. Chocolate complements many other ingredients to star in desserts, e.g., coffee, mint, peanut butter, and raspberry, to name a few of my favourites. If you are a devotee of chocolate malted milk balls, the chocolate-malted buttercream is reminiscent of the crunchy filling, with a different texture, of course. 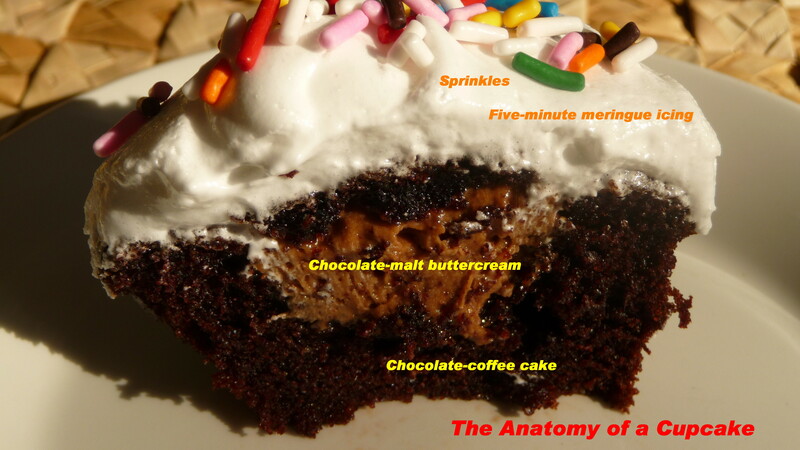 I found it to be quite addictive, which I must admit, at this point, in this cupcake anatomy lesson. In the midst of these cravings, my friend Kip happened to mention that it was Jim’s birthday (which I should have remembered as he is precisely 12.5 years older than I am!). A birthday cake on this island can be a bit of a challenge for those who do not like to bake, as there is one bakery – closed for holidays, at the time – and one baker who makes sumptuous cakes with impressive decorations, which are priced accordingly for major special occasions. And Kip will be the first to confess to not being a baker, though she is a marvelous cook. So I told Kip that I would bake something to celebrate. I wanted it to be visually impressive, as Jim is one of the top professional photographers in Canada! 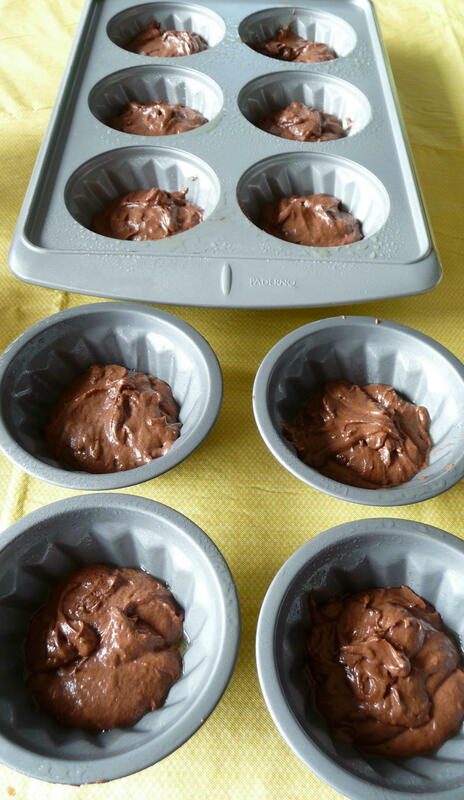 Initially, I had planned to bake a cake, but the image of Hostess cupcakes I had seen in the US recently kept making me think of filled cupcakes, an undertaking I had never attempted before. 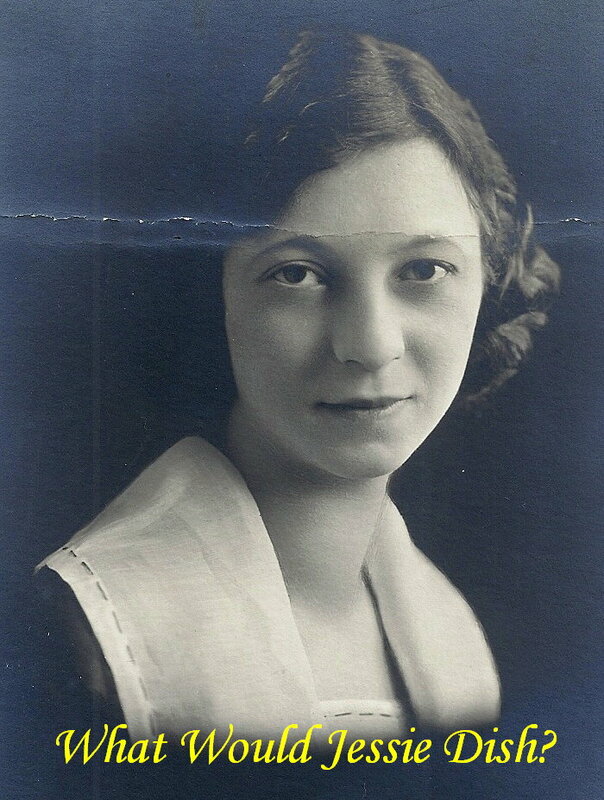 As I have been in a more reflective state with my series on my grandmother, Jessie, I was thinking recently of a cupcake from a neighbourhood bakery of my childhood, which was a chocolate cupcake, filled with a white marshmallowy-buttercream centre, and iced with a dark chocolate frosting. Thus, the Chocolate-Malt-Meringue Bliss Cupcake came into existence. 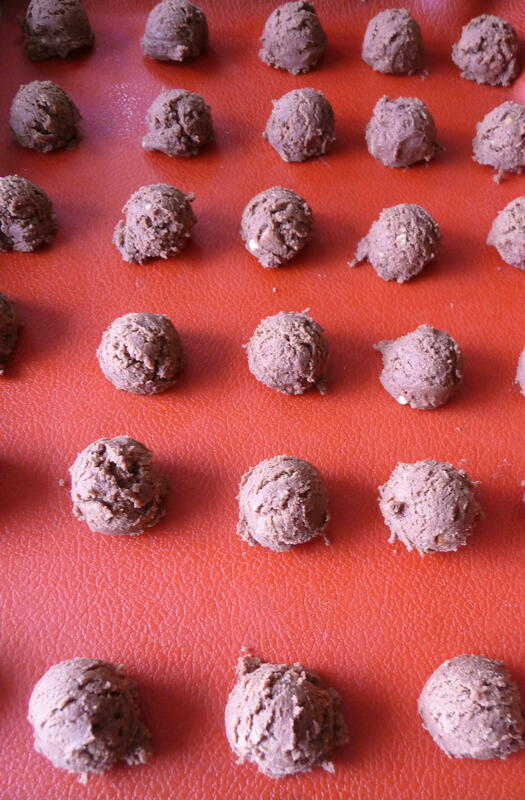 For the technique and the recipe…. What exactly is hot fudge pie? Before I baked this dish, I was not sure about this week’s recipe from my grandmother Jessie’s recently discovered files. 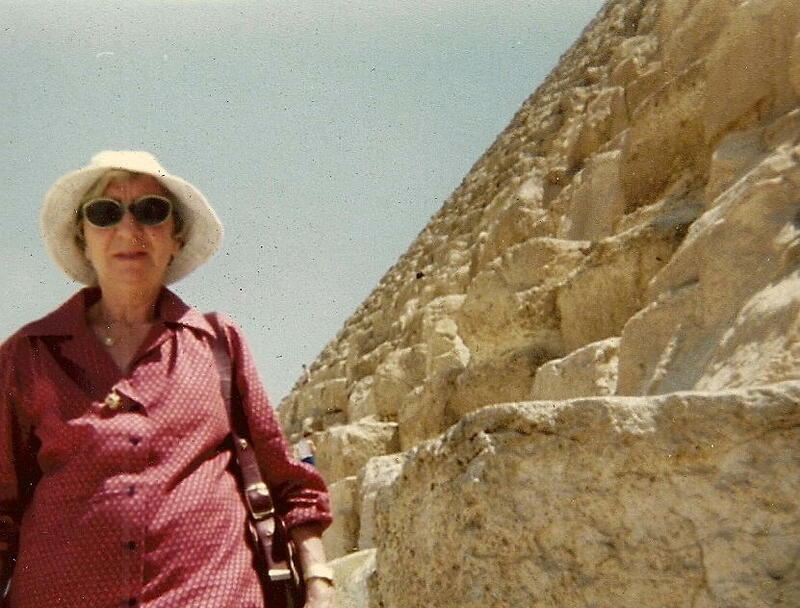 One thing for sure was that my grandmother liked hot fudge, chocolate, desserts, and sweets, in general. I recall that she enjoyed a good hot fudge sundae, frequently with coffee ice cream, at the old-fashioned ice cream parlours, which were once common across Chicago. She liked the Ting-a-Ling, very close to her last residence, a near-north-side condo. I imagine Jessie visited many of the south side institutions, e.g., Cunis’s, Cunag’s, Gertie’s, or the original Dove Candies – which has become a superstar of the American-commercial-high-end-ice-cream-bar-and-chocolate scene. When I visit Chicago, I do try to make it to Margie’s Candies, which still serves a traditional hot fudge sundae, featuring their home-made ice cream, in huge white plastic scallop-shell dishes. 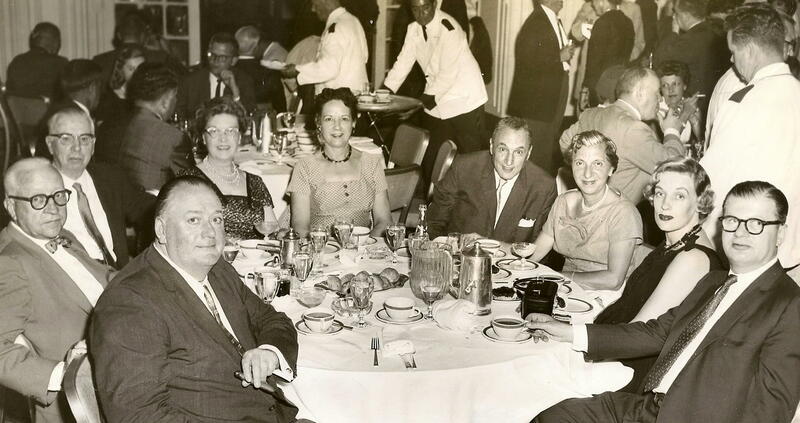 In Key West, Florida in the 1950s, Jessie wrote about what happens from eating too much hot fudge pie and such (on the reverse of the above photo). in the most audacious move of them all, drunk from the pitcher itself. These techniques indicated one’s personality, we speculated. Oh, right, this post is not about hot fudge sundaes. 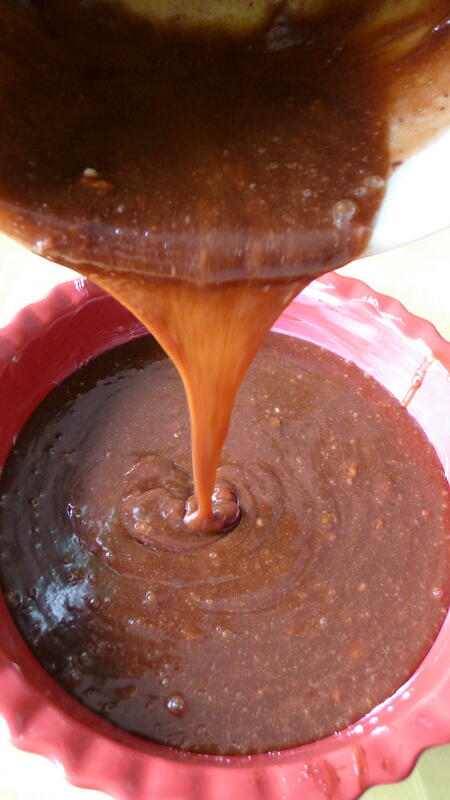 (I do promise to write-up a classic recipe from one of my cookbooks, Lost Desserts, by Gail Monaghan, which features a very special recipe for hot fudge sauce from a Los Angeles eatery, with the perfect viscosity and a truly profound chocolate-fudge flavour). 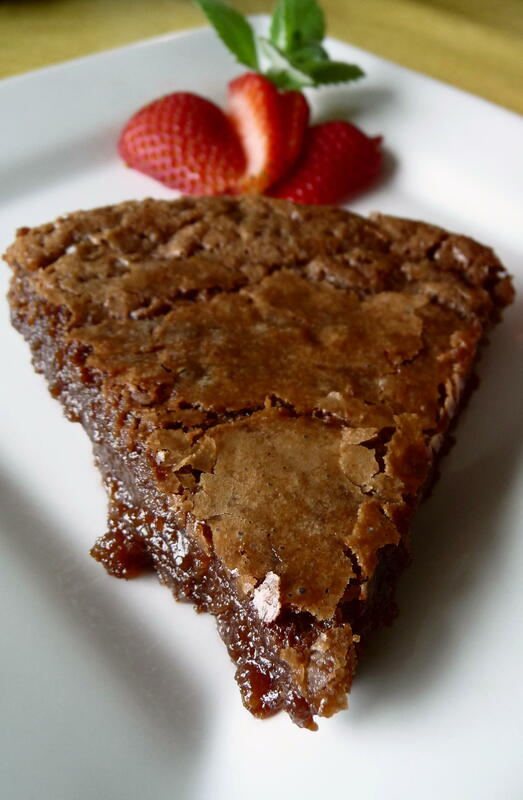 The hot fudge pie in question is a bit perplexing, as it is neither a pie nor a cake nor a brownie; it is in between a chocolate molten lava cake (the dessert of the 1990s), a self-saucing chocolate cake (very big in the 1970s), and a very moist brownie (timeless!). What exactly are these chocolate nut revels? 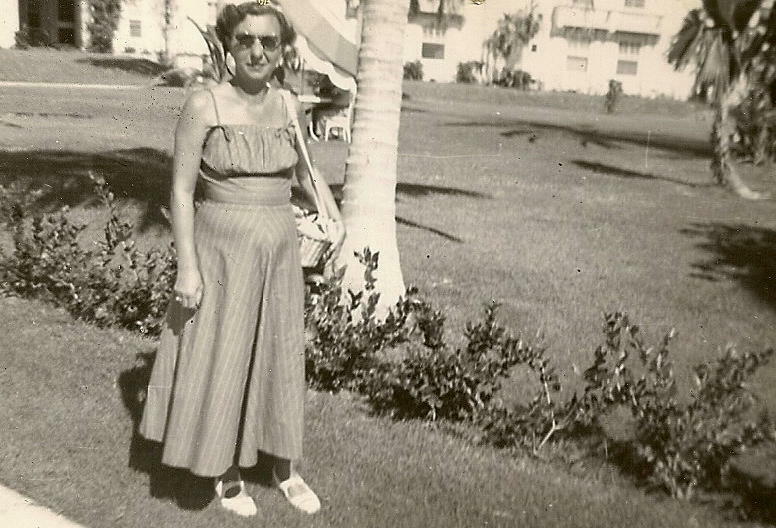 I was intrigued by this week’s installment of the lost recipes of my grandmother Jessie, especially as “revel” is not used often these days – much less as a noun than as a verb. 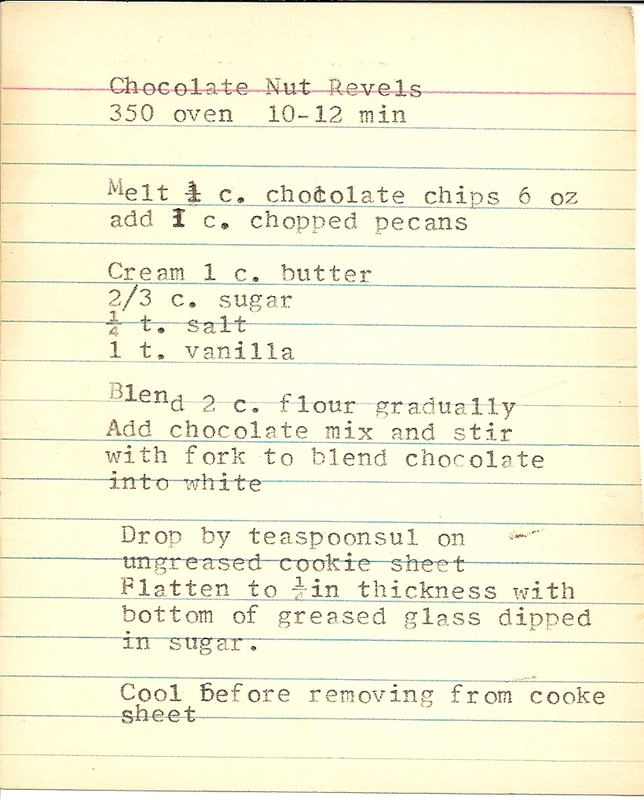 Of course, as I mentioned in previous posts, Jessie reveled in baked goods and sweets, so it is no surprise that the Chocolate Nut Revels were among her index cards of recipes. In preparing it, I followed the ingredients precisely yet made a few modifications in technique, so I will only make a couple of notes in addition to the recipe at the end of this post. 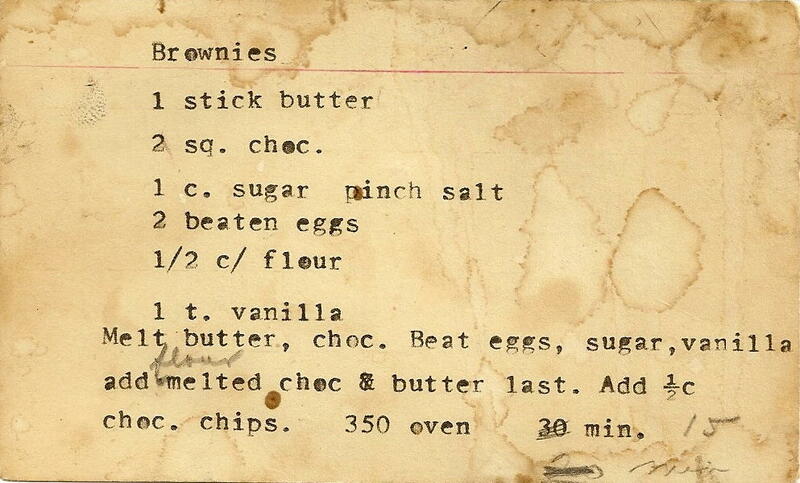 Of the nearly 20 recipes I recently found in my grandmother’s file, I was most excited about the one for brownies. 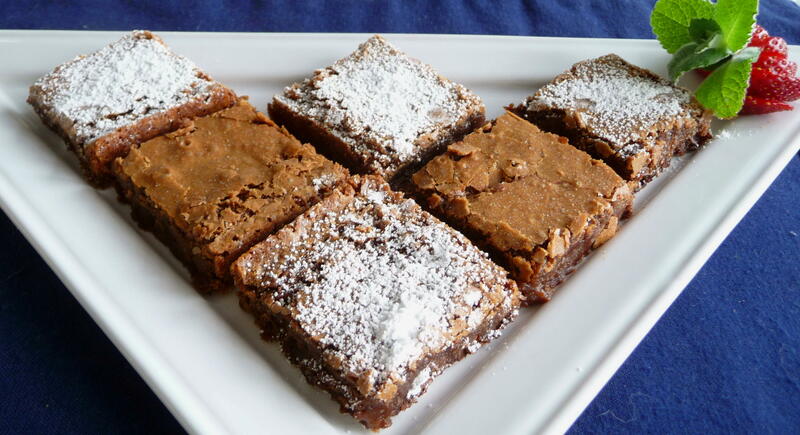 I recall these brownies from my childhood and often wondered what exactly was the recipe was for Jessie’s version, which she always dusted with powdered sugar. 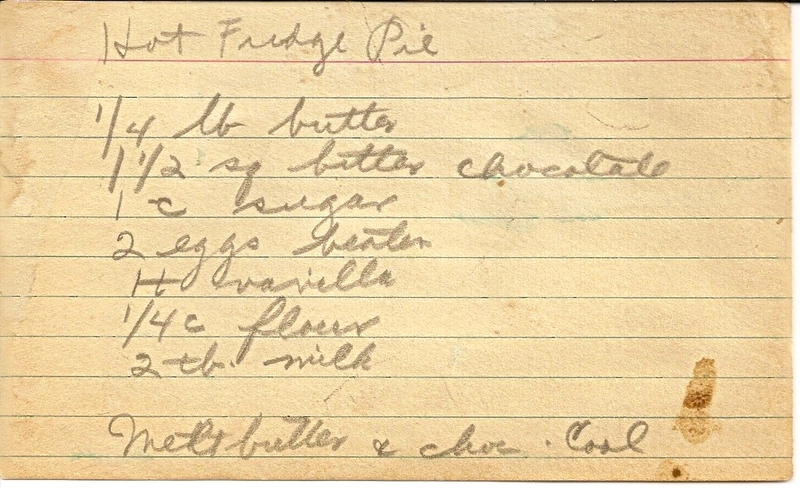 If the amount of sugar and chocolate chips are an indication in the recipe below (typed neatly on a 3″ x 5″ card), my grandmother definitely had a sweet tooth. For further proof, the majority of recipes I discovered are on the dessert/sweet side. Then there was the hiding place for sweets in Jessie’s living room. 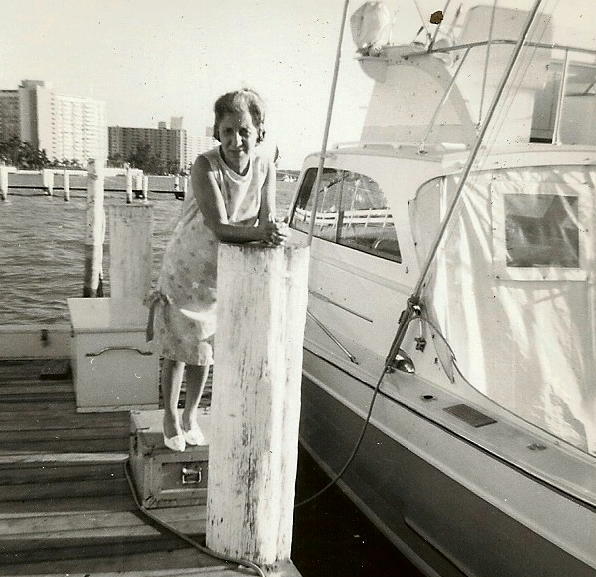 Whenever I went to my grandmother’s apartment, I immediately would head over to a small end table – with a false-front of leather-bound books – which opened to reveal a cache of sweets: spherical chocolate mint candies in pastels (a chocolate centre was surrounded by a thin white fondant layer of mint, with a harder panned coating), jelly fruit slices, various hard candies (the least interesting to me), and boxes of Fannie May Chocolates. This Fannie May had nothing to do with the mortgage crisis in the US, but rather was a Chicago institution until recently, when most of its retail stores started to close down, leaving just an online presence. I especially liked their Mint Meltaways, maple walnut fudge, and a thin chocolate mint for summer, in pastel pink or green, with some crunch peppermint candy bits embedded, which I have just learned, is known as “pink ice” (I saw no reference to the green variety, which I distinctly remember, too). But back to the brownies. I recall the squares from my childhood as being a little more cakey than the recipe I prepared. 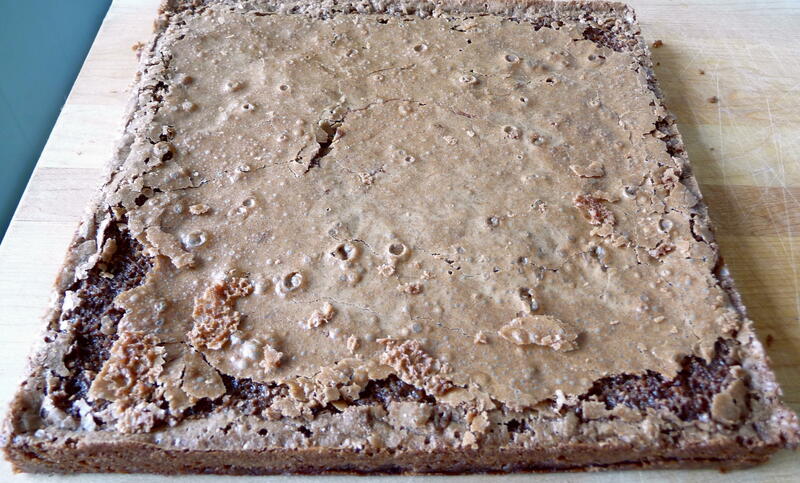 The batch I baked were actually a fine example of a gooey-soft-chewy brownie – decidedly not cakey and a bit more delicate than dense fudgey ones. This is a very quick dish to bake, and it would be good to whip up at a moment’s notice for company or a week-night dessert. I remember hearing in management meetings at one job that men generally need to hear the same thing three times from other men and an amazing seven times from women. While I do not know if this is strictly true, I came across the recipe in this post three times before making it finally; however, the sources were both women and men – for whatever that is worth in this equation. First, I watched Rick Bayless prepare ChocoFlan a couple of years ago on Mexico One Plate at a Time. I always enjoyed going to his restaurants, the first few years they were open in Chicago, when I still lived there. I never met him or even recall seeing him at Frontera Grill or Topolobambo, but I made sure to watch his television program whenever I can, as he is intelligent, funny, and unsurpassed by any chef specializing in the many diverse regional cuisines of Mexico. (When I wrote that, I was wondering if people might think, “Tostados, burritos, tacos, enchiladas, salsa, and guacamole – are those the diverse regional cuisines?” Or, “Is chimichanga a region?” Of course, I quickly realized that you, my dear sophisticated readers, would never think that!!). The Mexican Hot Chocolate cake batter goes in first. 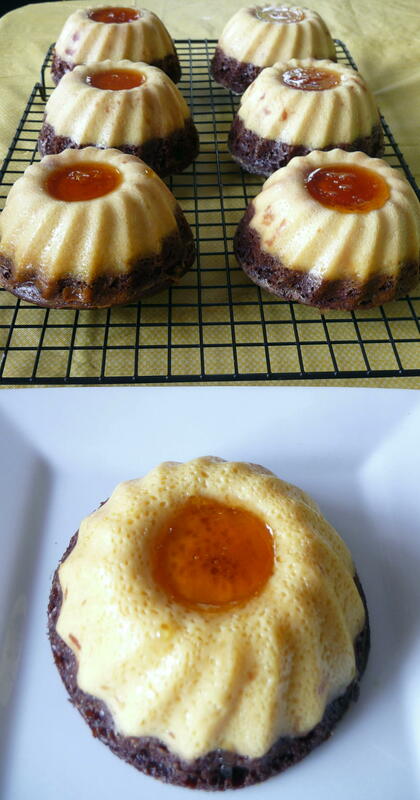 I saw the episode in July, 2008, when I looked up the recipe and saved it electronically for the day I would need a magical-preso-reverso-chocolate-cake-and-flan for a party. 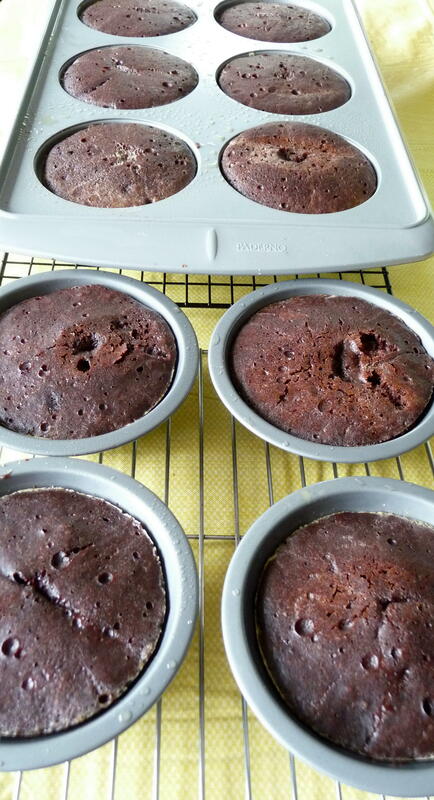 So then I noticed the mini version on Krissy and Daniel’s fun site, The Food Addicts, and then I thought, the time is nearing when I will now make a smallish version of the cake. I checked out their original source from The Food Network, Marcela Valladolid. After my recent foray into the Bundt-baking world, I remembered my mini-Bundt pans I had bought for a Dorie Greenspan recipe I have yet to make. So I looked up the recipe source Krissy and Daniel featured a week later (the third step) and decided to use most of Rick’s instead, given they were virtually identical and Rick’s descriptions were more detailed. 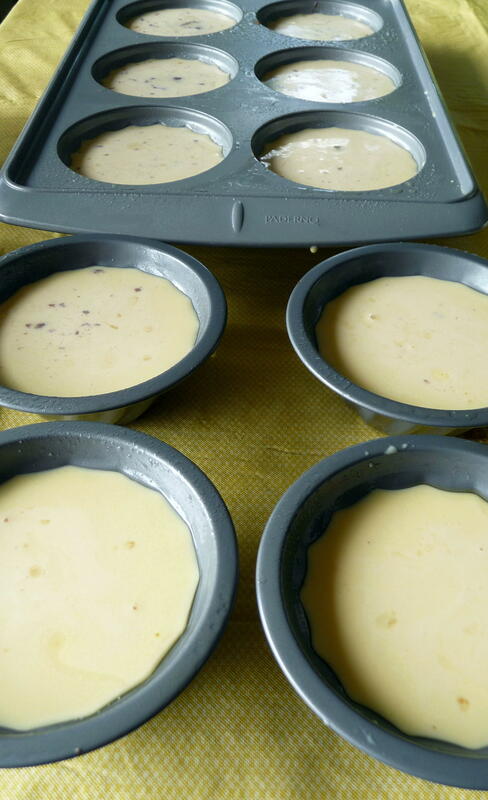 However, I did use Marcela’s flan ingredients (one less egg but four ounces of cream cheese, in order to use up the latter, sitting around in the fridge!). Next comes the flan topping. I adapted it by adding cinnamon and cayenne to make it into a “Mexican Hot Chocolate” version. This adaptation I decided to do for a Moroccan-Indian dinner party, as the cayenne and cinnamon complemented spices in the dishes the hostess was preparing. 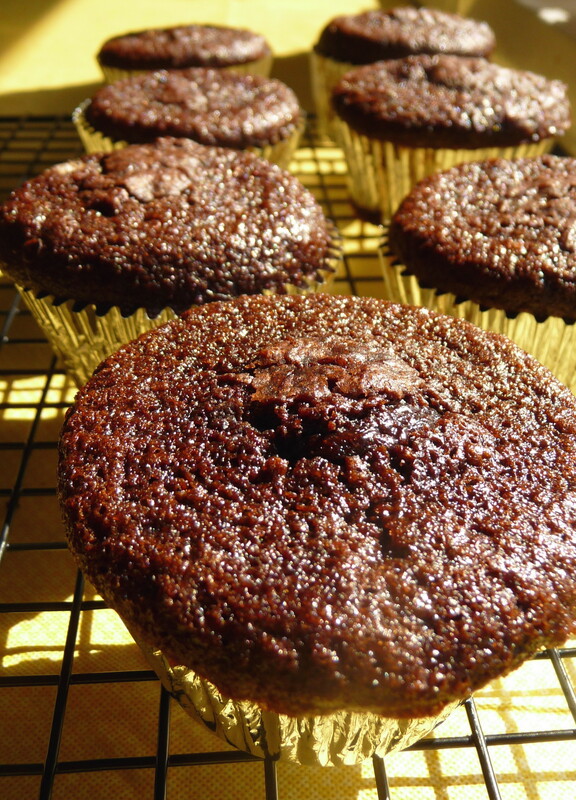 I suggest trying my version, if you like a more lively cake – remember my “2 x C3” Cocoa-Cayenne Cupcakes with Citrus Cream Cheese frosting? Impossible?!? The layers have switched places. The cookie above left is smooth, while the other had the jagged-edge technique. What can be more satisfying than finding what you were seeking for years? 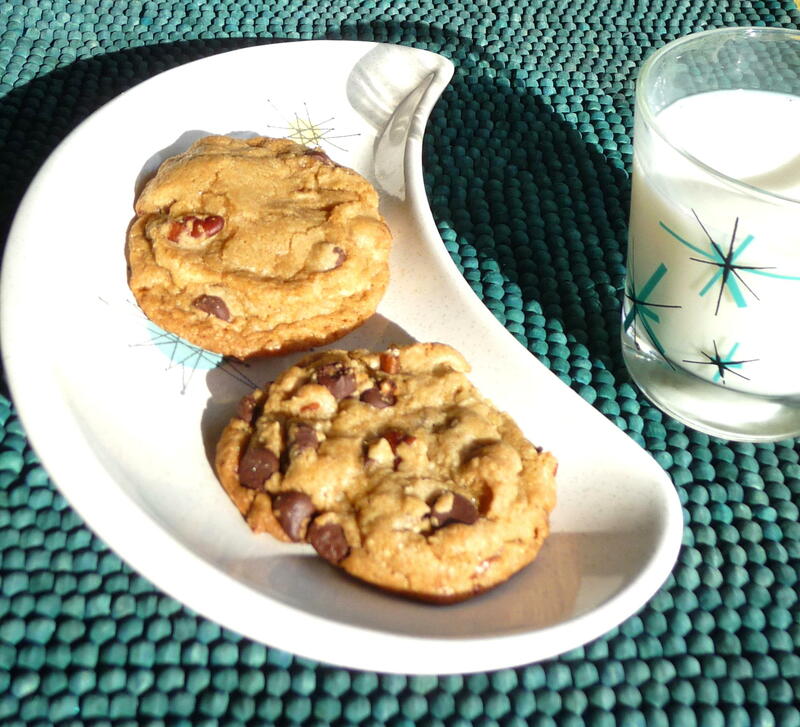 The perfect chocolate chip cookie can be elusive, despite its simplicity and iconic status. 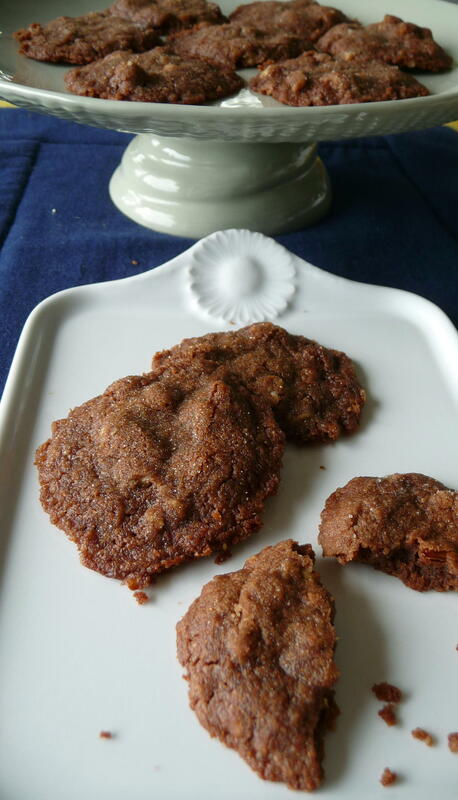 Over the years, I occasionally would discover a bakery or home baker who created the ideal cookie: one that has a minimally crisp circumference, contrasted by a soft, chewy pliable interior, yet filled with more-than-enough chocolate chips and the nutty counterpart of pecans or walnuts. The nut-component truly is optional, but I will dare to take a stand and declare that I am 100% pro-nut. However, I never did find a recipe to produce the ideal treat. 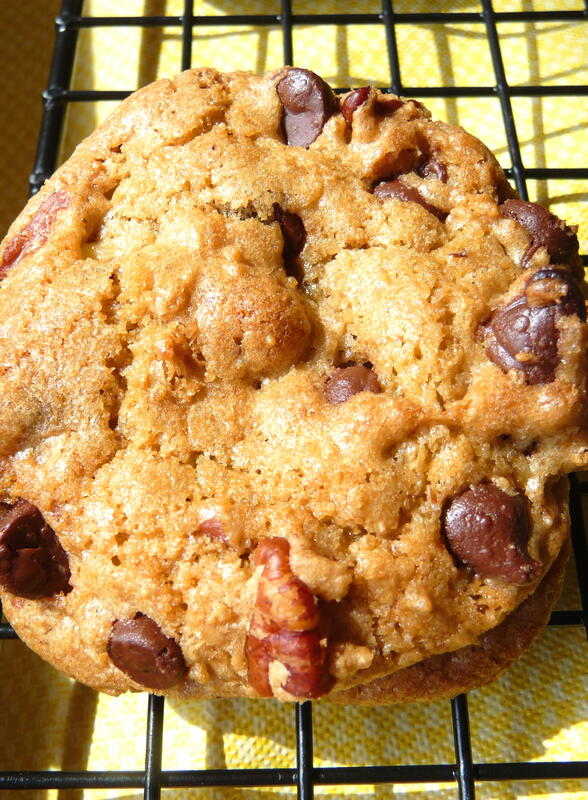 I even bought a cookbook nearly 25 years ago – and still have it – entitled enticingly, The Search for the Perfect Chocolate Chip Cookie. This book promised to reveal the paragon of chocolate-chip-iness, yet none had the exact texture I craved. Many of the award-winning recipes are good, and there were some interesting variants on the classic…just not “The One”. Just before the Olympics started, I baked cupcakes for my friend K’s birthday. 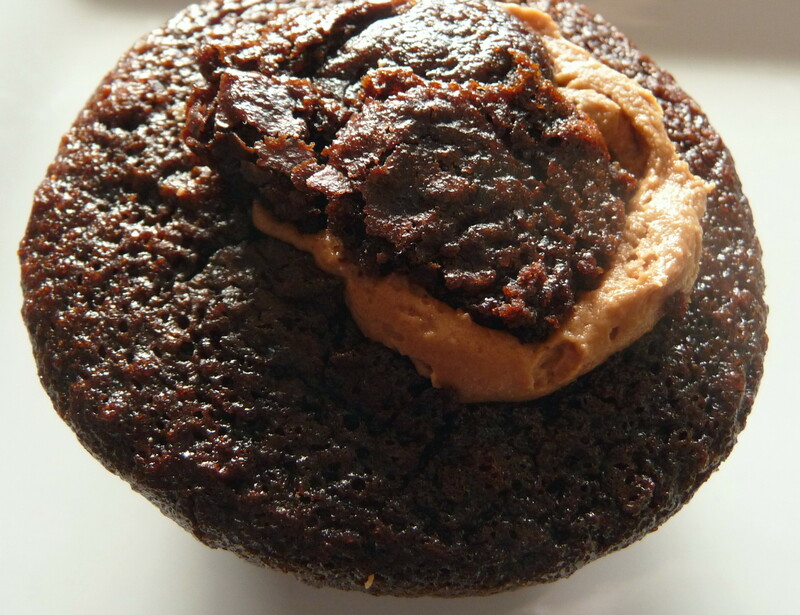 The one I chose was a variant of Martha Stewart’s one-bowl cocoa cupcake recipe and La Martha’s cream-cheese frosting. I decided to adapt this never-fail one-bowl very-hypenated recipe to make it spicier (cayenne) and create more depth in the cake (my favourite addition of espresso powder). As I had made Martha’s recipe before in addition to a Mexican hot chocolate cupcake, I decided to synthesize the two for this sassy-zesty variant. 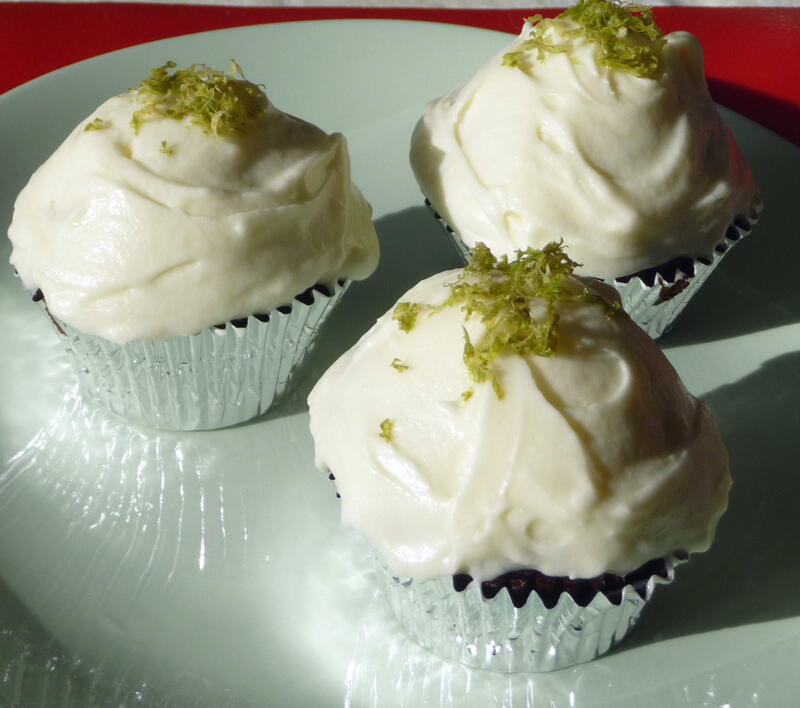 To top it off – literally and figuratively – I adapted a classic cream-cheese frosting by adding both lime zest and juice. 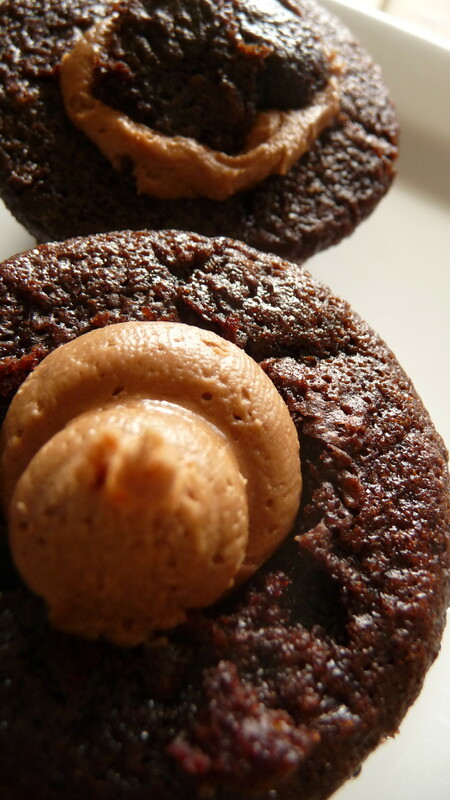 With all those words beginning with “C”, the math geek in me decided to rename this combo as “2x C3″: Cayenne-Cocoa Cupcakes with Citrus-Cream-Cheese Frosting. If you are seeking an unexpected yet perfect end to a Mexican/Latin American or spicy Asian meal with chili and lime, look no further.